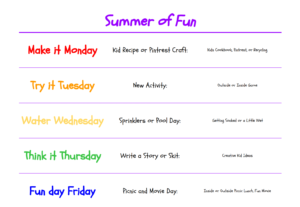 Over the past month, I’ve been thinking of some fun things to do with the girls over the summer. I am not watching any extra kids over the summer, other than my niece. Anyone else having problems with the kids wanting to spend the whole day watching TV or playing video games? Or maybe they WANT to do something, but you can’t think of what to do? I can help! 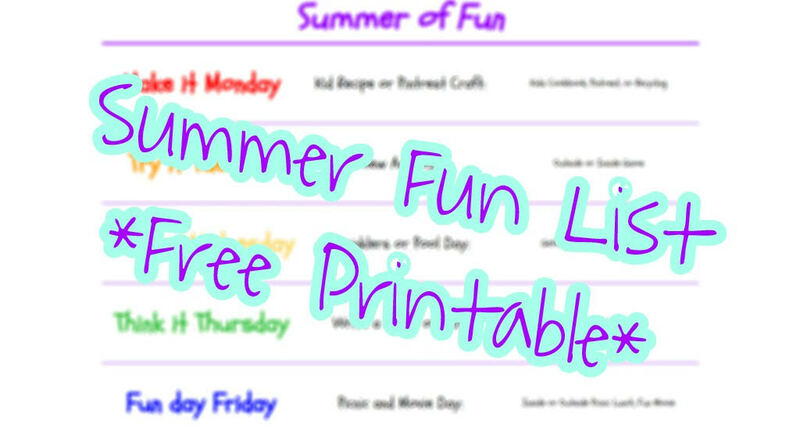 Today, I wanted to give you a list of ideas to do over the summer, as well as a printable theme of ideas at the bottom of this post that you can print and put in the house to get the kids excited about what’s next. These ideas are great to do for your own kids or if you are watching other kids as well. Make something together! A snack, lunch recipe, or craft. Kids are great and mixing and decorating. Fruit Salad. Grown-up does the cutting and kids put fruit into their own bowls to mix and eat. Cheese and crackers tray. Get sliced cheese and cut them into 4 pieces. Give the kids a variety or just one kind. They can arrange it on their plates and make mini sandwiches! Cookie or Cupcake decorating. Make sugar cookies or cupcakes ahead of time and let the kids decorate with sprinkles, fruit, or other toppings. Trail Mix. Fill bowls with different treats (popcorn, m&m’s, pretzels, Cheez-its, marshmallows, ritz cracker sandwiches, etc). Give the kids a small bag and help them scoop snacks into their bag. Toilet paper roll bird feeder. Recycle craft! Paper Towel roll and paper plate ring toss. Find a craft on Pinterest or pull one from your memory. There are so many ideas out there! Try something new! Or redo an old fun activity. Red light, Green light. Helps teach traffic light meaning, colors, and paying attention. Hopscotch. Counting! You can use different colors too. Floor is lava! This is a favorite. You can put blankets, pillows, or couch cushions. Water Play! Getting soaked from head to toe, or getting just a little bit wet. Go swimming! Big pool, blow up pool, or kiddie pool. Whatever you have available. Sprinklers. Just plug in the water hose and let them run around. Sprinkler games. Play soccer, kickball, or limbo with the sprinklers on! Water ball toss. You can find some pool balls and put them in buckets of water. Throw them around and the kids will get just a little wet. 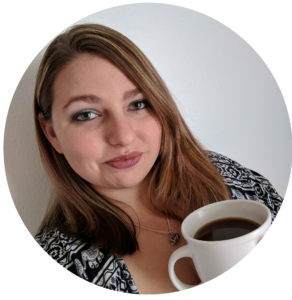 Help the kids write a story or skit. Help the kids write cards or letters to someone special to them. Write letter to the seniors at the nursing home. Make up a silly song and dance. Share day, bring a toy from home. Thank you for reading and I hope this has helped give you some ideas for the summer.